Tonight's recipe is from Every Night Italian by Giuliano Hazan. This is one of my favorite books. Chris gave it to me a few years ago and it has been used a lot. There is not a bad recipe in the book. 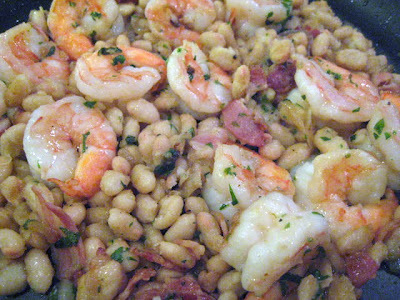 The shrimp and beans are fantastic together and than add pancetta and forget about it! This recipe serves 4 people so I cut it in half and there was just enough (but no leftovers). It is noted in the cookbook that the recipe can be prepared in 2 stages. The beans can be prepared ahead of time. Than the shrimp are cooked at the last minute and will be done in the time it takes for the beans to reheat. As a side dish I sauteed some Swiss Chard with crushed red pepper, olive oil, salt and pepper. Quite good. I don't have that cookbook, but if the dishes are all as good as this, I see it in my future. Love swiss chard prepared simply, the way you did too.